i found this on etoys today when i was looking for their toy recommendations for boys and girls of different ages. 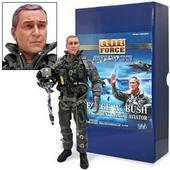 here's part of the description: "BBI proudly introduces the latest issue in its Elite Force series of authentic military 12- inch figures, President George W. Bush in naval aviator flight suit. Exacting in detail and fully equipped with authentic gear, this limited-edition action figure is a meticulous 1:6 scale recreation of the Commander-in-Chief's appearance during his historic Aircraft Carrier landing." i can't think of a better gift for a 17-year old girl! go W! 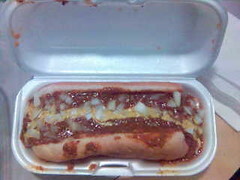 got this hot dog at woodward coney island in detroit. a dog with everything there is chili, onions, and mustard. it was a good dog.